The current Sponsorship period runs from July 1, 2018 through June 30, 2019. The The ISACA® Tulsa Chapter serves the greater Tulsa metropolitan area by providing education, membership, and other services to its professional membership of 160 members. The Tulsa Chapter members come from diverse backgrounds in a variety of public and private industries such as the Oil and Gas Industry, Financial Services, Consulting, Public Accounting, Aerospace and Defense, Telecommunications, Higher Education, and many more. The members also cover a variety of IT-related positions that include IT auditors, consultants, educators, IT security professionals, regulators, chief information officers, and internal auditors, to name a few. 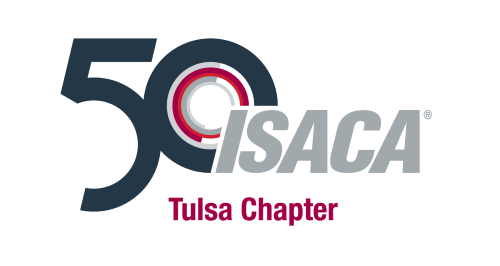 ISACA-Tulsa has over 160 individuals on its mailing list, which is used to routinely communicate chapter news and events. Sponsorship opportunities are available on an annual and per event basis. Annual sponsorship details and benefits are described below. Per event sponsorships can range from sponsorship tables to event sponsors. If you have any questions about the program, or are interested in an event sponsorship, please contact the Marketing Director. The Tulsa Chapter established the Chapter Sponsorship Program to allow organizations to support the chapter and IT professions, which allows the Tulsa Chapter to provide more services and higher quality events to our members. In return, sponsoring organizations are provided opportunities to promote, advertise, and interact with our membership.This is a WIN-WIN for ISACA-Tulsa, its members, and our sponsoring organizations. The sponsorship period runs from July 1 through June 30 each year. You can make a sponsorship payment by contacting chapter leadership. Instructions will be given for providing your company logo.